WHO IS AZARGA? – Protect Water for Future Generations. Azarga Resources Limited, is a Chinese company that has never mined uranium. After owning part of Powertech since 2013, it is now merged with Powertech to form a new company named Azarga Uranium. The new ownership controls the former Powertech’s operations in South Dakota, as well as uranium interests in Colorado. The former investment banker who heads Azarga Resources is Alexander Molyneux, who was born in Australia. See the chart for a full picture of Molyneux’s dealings. Molyneux left investment banking and entered the mining industry with the help of Robert Friedland, a dual citizen of the United States and Canada who lives in Singapore. Friedland is known by some as “Toxic Bob,” partly for his role in the disaster at the Summitville gold-silver mine in Colorado. The Summitville mine was run by a subsidiary of Friedland’s company, Galactic Resources, which was based in Canada. It is now a Superfund site that discharged acid drainage and cyanide, arsenic, cadmium, copper, lead, mercury, and other heavy metals into the Alamosa River. Friedland’s bankrupt subsidiary pled guilty to 40 felony counts. Cleanup, which is expected to cost $150 million, is ongoing. For more information on Azarga’s multinational dealings, see www.powertechexposed.com – center column. Whether Azarga intends to actually mine uranium in the Black Hills remains to be seen. It is also possible that the company hopes to make a profit by getting mining permits, then selling the proposed mine site to someone else. Regardless of who owns uranium properties in the Black Hills, the Clean Water Alliance opposes uranium mining in the area. Azarga/Powertech statements face scrutiny by the British Columbia Securities Commission, and the stock price drops. In a related story Canadian regulators consider Azarga’s preliminary assesments “too speculative geologically.” Azarga acknowledged certain “deficiencies” in its filings relating to the Dewey-Burdock project. There should be NO deficiencies where OUR WATER is concerned!! The federal Environmental Protection Agency has done a preliminary assessment of the old uranium mines in the southern half of Powertech’s proposed project site. This preliminary assessment can be found here, and the Clean Water Alliance Press Release can be found here. The EPA found that there was contamination on the site (no surprise there). And it said more formal testing is to be done in 2015 to determine whether the site should become a Superfund site. 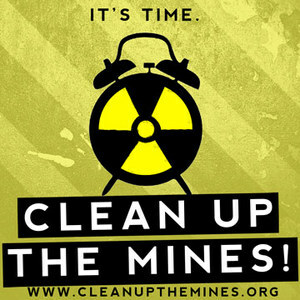 This would require clean-up of the old mines. Usually, the EPA looks for the original mining companies to pay for the clean-up. If they can’t be found or don’t exist anymore (likely), then the site is cleaned up by the federal government, when money is available. However, if the site is designated a Superfund site, it might make it difficult for Powertech to start more mining until the site was cleaned up. The company would probably still have access to the northern half of its project area. NRC ignores NHPA for thorough cultural resources analysis and their SEIS also lacks independent research on the probable impacts of the potential hazards of the uranium mining project. In our Jan. 2014 Press Release BHCWA warned the public that the NRC has put the cart before the horse – however, they published a “Final” SEIS – and chosen a final alternative for project design – before they have completed the cultural resources analysis. This analysis is required by law to be completed before this document was issued. The SEIS notes that the analysis is “ongoing.” This relegates the cultural studies to afterthoughts, and necessarily limits NRC’s ability to protect these important resources. The NRC accepted public comments on the Final SEIS in the form of limited appearance statements and thanks to citizen’s actions, many comments were sent in. COLORADO AND VIRGINIA REJECTED PROPOSED URANIUM MINING. South Dakota’s legislature has done nothing but encourage it. In South Dakota in 2008, changes were made to Water Management Board Regulations to remove the requirement that that before an in-situ uranium mining company could get a mining permit from the State, it had to prove by demonstration that it could restore the aquifer it wants to mine to its baseline (pre-mining) levels of radioactive heavy metals, arsenic, dissolving agents, etc. If it could not, and technology still can’t make it so, then a mining permit application would have to be denied by our State DENR. For a detailed review of this South Dakota regulations and discussion. In 2011, a South Dakota Senate Bill eliminated the DENR’s ability to regulate in-situ leach mining in South Dakota. Read more here. There were three bills in the 2013 South Dakota Legislature that would have reversed these changes, but unfortunately were not passed. Senate Bill 148 would have returned state regulatory authority over in situ leach uranium mining. This is the authority that was taken away in 2011. Senate Bill 149 would have changed the current law that gives companies 30 days to report environmental violations without any penalty. Instead, under this bill, the companies would have to report environmental violations within 24 hours. Senate Bill 150 Would have provided additional protections that: (1) require uranium companies return water to baseline conditions after they mine, (2) let the Secretary of the Department of Environment and Natural Resources determine if it is feasible to mine safely in a particular place, (3) allow a mining permit to be denied if the company cannot demonstrate that restoration of water will work, and (4) require full restoration of water quality after mining. Don’t just take our word for it. Check these links to experience for yourself what other concerned citizens, your neighbors, have to say about uranium mining.